This article appeared in the Winter 2006 issue of Texoma Living! If Jeff Teel has anything to do with it, Sherman is about to blast off into space—in a small way of course. Less than a year ago, Teel, who is an over the road truck driver when he is not acting like Werner Von Braun, and his two partners, Harold Savage, who likes “Tiny” better than Harold, and Kevin Earls, an engineer with Texas Instruments, started Launchpad Spacecraft. Before you develop any Buck Rogers fantasies, be forewarned; if you are over six inches tall, you won’t fit in the space ships. Launchcraft makes models, you see. And what models. The initial effort was miniature version of Friendship 7, the Mercury capsule that John Glenn rode in to space on February 20, 1960 to become the first American to orbit the Earth. From the start, it was clear that out-of-the-box was not the plan for Teel and his friends. It took more than a month to build the kit; “We just got creative,” Teel said. Teel has been a spaced out kid since he was in the third grade. “I was staring out the window, daydreaming when the teacher came over and asked if I knew men were walking on the moon at that very moment. It was the Apollo 17 mission, and I got so excited I went straight to the library and got a book about John Glenn,” he said. His interest in space never went away, but more mundane matters intervened. He worked in a factory after he graduated from Sherman High School, and then, at 28, decided he was missing out on a lot of things due to his lack of higher education. “I realized all the things I didn’t know,” he said. Jeff Teel meets one of his childhood idols, astronaut Wally Shirra. Shirra was one of the first seven astronaut selected in 1959 for NASA’s Mercury space program. Four years at Southeastern Oklahoma University in Durant helped to remedy that, and when he graduated, with a Bachelor of Science, he got a job with the Fort Worth Zoo. As for his space fantasies, “I never did real well in math, so I never pursued it,” said Teel. The zoo job was interesting, but did not pay very well, and so after a few years it was back to Sherman and my job as a truck driver. Until, he went to an astronaut convention in New York in the summer of 2005.
than the last. When a question arose about the control panel lights on one of their models they went to the source. 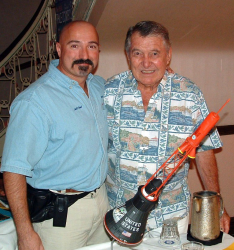 “I talked with Wally Schirra, and he corrected the lighting in the model,” Teel said. The lights were blue, not red. Teel builds capsules. Earls is in charge of the boosters, the rockets. 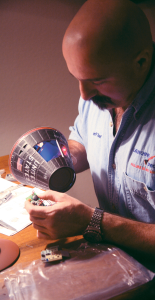 A model builder of many years experience, he brings his expertise to a plan to build a 1:48 scale Saturn V that will actually launch, as in blast off, as in fly in the sky. “It’s a kit, but we’ve modified it so you can see the LEM inside. You can just display it, or you can launch it,” Teel said. If you opt for the working model, there is a parachute in the nose designed to deploy when the model runs out of fuel and bring the rocket gently back to earth. Well, that is the plan, anyway. Savage often works in a machine shop in Whitesboro, where Launchpad plans to build a full scale, 10 foot by eight foot Mercury capsule. They already have molds of the side panels, the “shingles,” taken from the real thing. The models all start as boxed kits, but as the spacecraft become more detailed more and more of the parts must be scratch built from little more than blueprints and sheets of styrene. Each project is a learning experience, as the builders seek ways to increase the detail in their work and speed up production. Right now, working every free moment, it takes six to eight weeks to build a Mercury capsule. That is fine for one off work, but the folks who run the NASA gift shops would like to add a line Launchpad Spacecraft models to offerings, and Teel says they haven’t figured out how to meet the demand yet. But they will; don’t doubt for a moment that they will.